"Making your own" is a big part of home cook culture. One's reasons for wanting to DIY every food thing may vary, but it usually has something to do with taste, health, or cost. Cost-wise, some things are obvious; cooking dinner at home is almost always cheaper than takeout, but things aren't as straightforward when it comes to making your own staples. Food is more expensive than ever, and it may seem like your only cost-effective options are fast food or instant ramen. But it doesn't have to be that way. To see if it really is cost-effective to make your own bread, hummus, and other commonly DIY'd foods, I did some maths — dimensional analysis, to be honest, which is the only tool from four years of studying chemistry that I still use — and calculated how much it would cost to whip up these treats yourself. Of course, this doesn't necessarily tell you if making your own is "worth it," as the "worth" of a recipe hinges not only on cost, but also taste and whether you derive joy from making it. Initial Investment: All you need to make your own yogurt is two litres of milk and half a cup of yogurt with active cultures, which you can easily obtain for less than $5. Cost per batch: The cost per batch is the same as the initial investment, but you get two quarts of the stuff. Cost of store-bought yogurt: A single tub of whole milk yogurt will set you back two or three dollars, depending on where you shop. Is it cheaper? : Yup. About twice as cheap. Things to consider: Yogurt is one of those things that can have a lot of added sugar, and making your own lets you flavour it as much or as little as you like. It is, however, a slightly involved process - and you'll need a thermometer - but it's not difficult once you get the hang of it. Initial Investment: If your house is completely devoid of sugar, flour, and oil, buying all the bags and bottles you need can cost as much as $20, especially if you like fancy flour. Cost per batch: However, once you have all of those ingredients, the cost per loaf of this delicious Amish-style sandwich bread comes out to about $3. Cost of store-bought bread: White sandwich bread can run anywhere from 89 cents to over six bucks, depending on where you shop. Is it cheaper? : This DIY loaf is certainly more than the stuff you can find at a discount outlet, but it's about the same as most sandwich bread, and cheaper than the fancy stuff you'd get at a bakery. 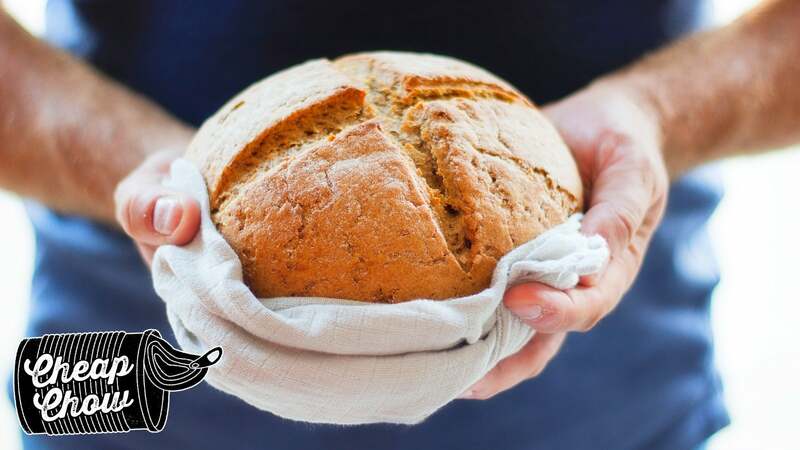 Things to consider: Homemade bread will grow mould more quickly than store-bought, but this can be mitigated by keeping slices of it in the freezer. Also, this bread is delicious and very satisfying (and surprisingly easy) to make. Initial Investment: Tahini isn't exactly cheap, so the initial investment on this one is somewhere between $15 to $20, depending on where you shop and whether you use dry or canned chickpeas. Cost per batch: A batch of hummus made with dried chickpeas will set you back about $4, using canned will bring it up to around $6. Cost of store-bought hummus: Four to six bucks for a tub, depending on the brand and where you shop. Things to consider: Making your own hummus lets you mess around with both flavour and texture, meaning you can add as much damn garlic as you like, or maybe get crazy and refry the chickpeas. Initial Investment: If you live in a house without oil and vinegar, you should buy some, for that is a sad house. This very important investment (plus a bottle of mustard and some garlic) will cost you $15-$25, depending on how fancy your olive oil tastes are. Cost per batch: Each 100ml serving of homemade vinaigrette (enough for a large salad) comes out to about $2, which translates to around seven dollars for a "bottle's" worth. Cost of store-bought salad dressing: Typically around $4-$5. Is it cheaper? : Technically, no. Things to consider: It is unlikely that you don't need olive and oil and vinegar for other things, and buying olive oil and vinegar is cheaper than buying olive oil, vinegar, and a bottle of vinaigrette. Plus, making just a little at a time, as you need it, lets you fool around with flavours, meaning you don't have to commit to one bottle of one dressing for every salad you make for a month. Initial Investment: You really only need raw almonds, but a cup of them is going to clock in at over $5. Cost per batch: Up to $8, depending on where you buy raw almonds. Cost of store-bought almond milk: About $3 for a one-litre carton. Things to consider: DIY almond milk won't have any added ingredients, and you can flavour it as you like, but it will have a thinner consistency. Initial Investment: The needed milk, cream, and lemons will cost about $5-$6, more if you buy organic dairy. Cost per batch: $5-$6 will give you about two cups of fresh homemade ricotta. Cost of store-bought ricotta: $4 for about two cups. Is it cheaper: No. It's about the same, or slightly more expensive, depending on what kind of milk and cream you buy. Things to consider: Homemade ricotta tastes, without a shadow of a doubt, a thousand times better than the store-bought stuff. It is completely worth it to make your own. What staples do you like to make yourself? Do you make them to save money, or for other, more delicious reasons? Share your favourites in the comments below! Another one to consider, butter. You will end up with about 400grams of butter for a litre of cream and you also get butter milk as a by product to use which is also ~$5/l. BEER! 30 bucks will get you 23 litres of quite decent beer. But the initial investment is about a hundred bucks for a home brew kit. Ultimately you'll probably make your money back after 2 or 3 batches! I make sourdough bread from flour, water and salt - most of the time I use the cheapest flour from Woolies or Coles (around $0.79 per kg) so a decent-sized loaf uses less than $0.40 of ingredients. This doesn't include the electricity costs, but a tasty loaf, fresh from the oven for breakfast on a Sunday for that price is fantastic!